This little book is a reprint from 1987. It's a collection of three true stories of murder in Scotland, England and New York, rich with the details of Victorian life. 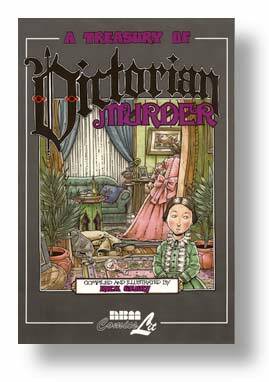 Geary has a wonderful talent for drawing the faces of his characters, and the book starts out with a parade of famous people from those times, from the young Queen Victoria to Sigmund Freud. There's also a great drawing of a cemetery full of beautiful gravestones. The three murders are briefly told, but the drawing conveys much of the detail. Geary makes the pages visually interesting by varying the frame format, with cells of various sizes and shapes, and narrative boxes appearing at all sorts of places in the picture. There's no great psychological insight into the murders or their effects, but some might find the comic treatment of death rather trivializing, but Geary's approach should have enough charm to win over most skeptics.